The Magic Invitational is going on right now! You can watch the action live in Magic Online, or read our coverage as it happens. This week (from Tuesday, May 11th through Saturday, May 15th) we will be holding the Eighth Annual Magic Invitational. As this tournament is near and dear to my heart, I asked if I could write an article about the tournament explaining what is it, how it began, talk about its history and tell you what you can expect from this year's tournament. Even if you think you know everything there is to know about the Invitational, I think you'll learn something. And if you know nothing? Then I know I'm golden. Let's get to it. What Is the Magic Invitational? It's the all-star game – Of all the high profile Magic tournaments run, the Invitational is by far the smallest. Only sixteen players are invited. And not just any players, only the cream of the crop. How do you score an invitation? Either by winning a key event (such as the World Championships), having a strong Pro Tour season (marked by either a high rating or the number of pro points earned) or being voted in on a player ballot by the Magic public. The tournament isn't about money – There's no purse on the Invitational (although an invite does come with free airfare and hotel). Rather the players are competing for something far cooler – the chance to become part of Magic. The winner gets to design his very own Magic card that will have him pictured in the illustration. The tournament has five formats – To spice things up, the Invitational changes formats every three rounds. That's five formats (three constructed and two limited). I'll explain the formats for this year's event later in the article. It has an odd finals – Here's how the finals work. The top two players after the fifteen round robin rounds play a best two out of three match finals (using the three constructed formats). Each match is best 2 out of 3 games. It could be over in four games. It could be over in nine. It's all played on Magic Online – The Invitational is the highest profile tournament played on Magic Online. Every match is recorded and can be watched by all of you at your leisure (more on this later as well). In addition, people online will have the chance to talk with players in between games. If this sounds interesting, please join us this Tuesday, Wednesday or Thursday (the finals are played Saturday night). How Did the Magic Invitational Begin? To start our story we have to travel back to 1996. At the time, in additional to my R&D duties, I was the editor-in-chief of The Duelist. For those of you that aren't old-timers, The Duelist, published by Wizards of the Coast, was the original magazine dedicated to Magic. Our publisher Wendy was interested in finding a promotional Magic event for The Duelist to sponsor. That's when I pitched my idea for the Magic all-star game. It had several key features that Wendy liked. It was flashy. It leant itself well to coverage in a magazine. And, most importantly, it only involved a small number of players helping us meet our limited budget. Everything seemed perfect except for one thing. We didn't have any money for a purse (it was all being spent on airfare and hotel rooms for the players). Limitations tend to breed creativity. I was forced to find a cool prize that didn't cost anything. And then it hit me. What if I let the winner design his own Magic card? I checked with then Magic Lead Designer Joel Mick. Joel said okay as long as the card was developed like any other Magic card. We had our prize. And thus, the Duelist Invitational was born (it wouldn't get its name change for a number of years). The very first Duelist Invitational was scheduled for San Diego. Our budget wasn't high enough to leave the United States. But then a major event (what was to be the very first Grand Prix) fell through in Hong Kong and we were asked if we would be willing to move our event to Asia. We quickly said yes. The first day of the event was run in a restaurant in the hotel. Players were allowed to order food while they played. The final two days were played in a local mall (malls are very popular places for tournaments in much of Asia). In the end, it came down to Swedish phenom Olle Rade versus American bad boy Mike Long. Back then, the finals was a single best three out of five match in a format agreed upon by the finalists. For the first Invitational that format was Type I. Olle Rade did some obscene things with a Snake Basket and won three games to one to win the very first Invitational. I'm sure you're wondering where the text went. You see, there wasn't any. To make matters worse, R&D had ended using enchant worlds with Visions meaning that Olle's card would be turned into a normal enchantment, removing the one use the card had. Counter target spell. Put CARDNAME on top of your library. Development playtested the card and found it bah-roken. So I asked Olle for another card. I never heard back. And so, the first Invitational champion never got a card (don't worry though, this problem gets fixed a few years later). Starting with the second Invitational, we began being hooked up with Grand Prix. This Invitational coincided with the very first Brazilian Grand Prix. It was hot and there were a lot of Magic players. As the jewel of the whole event, we were put into the only air-conditioned in the entire tournament site. Just to make things extra odd, all the walls of the room were clear plastic. This allowed the spectators (and there were a lot) to watch from outside the room. The players dubbed the room “the fishbowl”. Now don't get me wrong, we loved it. Air conditioning is not the most common commodity in Rio and we enjoyed greatly being able to play in comfort. In fact, all the various Wizards staff that had come to the event (helping run the Grand Prix) would visit the Invitational during their breaks to check in. Checking in, by the way, meant collapsing on the floor until their sweaty body got chilly. Development tweaked the card by adding the ability echo and changing it from a 2/1 to a 2/2. The art is an interesting story. At the time I came up with the prize of making a card, it never dawned on me to do anything with the art. But as fate would have it, I was in charge with writing the art descriptions for Urza's Legacy (the only set other than Unglued that I did that for). I knew the creature in the art was a humanoid, so I figured why not make it Darwin. I sent the artist (Ed Beard, Jr.) his picture and a tradition was started. As a final personal note, after the Invitational was over, my girlfriend and I stayed for a week to play tourists. During this time, I proposed to her (in the middle of the ocean for those that are curious). She obviously said yes. The Invitational had quickly become a fan favorite and we soon had offers from around the globe by foreign offices that wanted to host the event. We had been in Asia and South America. It was time for Europe. Once again we were booked with a Grand Prix (won interesting enough by Kai Budde). The biggest twist to this Invitational was that Sixth Edition was looming and R&D and the Magic Brand team had decided to debut the new Sixth Edition rules at the event. Everything went smoothly and the players' positive word of mouth on Sixth Edition went far to helping the greater Magic populace embrace it. And when I say everything went smoothly, I should say almost everything went smoothly. U: Long's Merfolk gains flying until end of turn. The card was tweaked to become Rootwater Thief. As a quick piece of trivia, this was the first Invitational where I designed special cards for the event. Click here to see the cards. This was the first year that the event officially became the Magic Invitational. Once again, we found ourselves playing in a mall (a very nice mall incidentally). This tournament would be Chris Pikula's one chance to shine. He ended up playing Finkel in the finals and to everyone surprise (possibly even his own) pulled out a three to two match victory. Once again I made up some cards for the Duplicate Limited format. Click here to see the cards. I would go into greater detail, but you see, I actually wrote a tournament report (not something I do very often) for this event. You want to know what happened? Click here. As The Meddler comes into play, name a card. Sacrifice The Meddler: Counter named card. R&D fiddled with the card turning it into a multi-color card (to fit the theme of Planeshift) and upgrading the card power. The end result was Meddling Mage. In addition, here is the on-line coverage of the event. The fifth Invitational took us to our fourth continent. My wife, my sixth month old daughter and I arrived a week early. The weather was breathtaking. And then the players showed up and it rained all week. The tournament itself though went well. This event came down to Jon Finkel versus Ben Rubin. Rubin put up a noble fight but was slaughtered in the finals by Finkel. This is the second Invitational where I wrote a tournament report (a rather lengthy one). If you'd like to know what went on “Down Under”, check it out (Part 1, Part 2). Destroy all creatures. They can't be regenerated. Untap up to four lands. Having been burned by the “free mechanic”, R&D asked Finkel for a new card. He turned in a card called Shadowmage of LekniF that with very little tweaking became Shadowmage Infiltrator. Shortly after this event, I was contacted by Olle Rade who was interested in finally collecting his prize. He wanted to know if it was too late to make a card. I informed him it wasn't too late but said that his picture in the illustration needed to match when he won (he had since been in the army and shaved off his long blonde locks). Olle's card became Sylvan Safekeeper and was released in Judgment. The reason that this Invitational took place the same year as Kuala Lumpur incidentally was that we moved the Invitational from the end of the Pro Tour season to the beginning. In addition, once again, here is the on-line coverage of the event. The sixth Invitational hit our fifth continent. This Invitational is the furthest trip I've ever taken. Including my layovers, the trip took about thirty-five hours. But it was well worth it. This Invitational is memorable for many things. One such thing is the fact that I got to pet a cheetah. In fact, you know that picture of me you see every time you read my column. 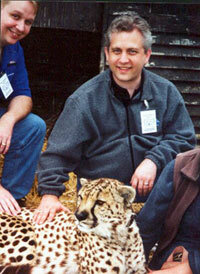 That is actually from a picture of me petting a cheetah (along with editor-in-chief Scott Johns, no less). The finals came down to Kai Budde versus Dan Clegg in what would clock in as the longest Invitational finals ever. (Something crazy like six or seven hours.) Budde and Clegg played best three out of five matches with each match being two out of three in a different format. It all came down to the fifth format – 250 aka Five Color. Using a quirky system that based wins on dollar value of ante won, Budde won the event by Tinkering for a Jeweled Bird to keep Budde from being able to win a valuable enough ante with his third turn Hatred kill. Opponents play with their hand revealed. U, Sacrifice Wisedrafter's Will: Draw a card. UU, Sacrifice Wisedrafter's Will: Counter target spell. R&D fiddled with the card to try and make it more relevant to the tribal theme in Onslaught. The card became Voidmage Prodigy. Many people have asked why Kai's card ended up so weak. The reality was that it wasn't weak. In fact, it along with Patron Wizard turned wizards into a powerhouse in R&D's FFL League (The Future Future League where we try to predict what the future will look like). The deck was such unfun to play against, that R&D nerfed almost all the other wizards to keep the deck out of constructed. To make matters even worse, the picture of Kai was felt by many to be unflattering. Wizards later made a promotional version with a new picture. And here is the on-line coverage of the event. It's ironic that the final continent (not counting Antarctica which I doubt will ever host an Invitational) to host an Invitational was North America. This year's focus was Magic Online. Because we wanted to make sure everything ran smoothly for our first big online event (and to make the event more entertaining for the players) we brought them all to Wizards of the Coast's headquarters. When Forestfolk comes into play, you may search your library for a basic land card and put it into play tapped. Then shuffle your library. When Forestfolk leaves play, draw a card. To fit into the artifact theme of Mirrodin, this card was turned into an artifact creature called Solemn Simulacrum. Here is the on-line coverage of the event. And that brings us to this year's event. The event is still being held on Magic Online but this time we've moved the player to the largest electronic entertainment convention in the world, an event known as E3 (Electronic Entertainment Expo). Here's a link to this year's formats as well as a link to this year's Auction of the People decks. In addition, here is a link to this year's competitors. Note that current World Champion Daniel Zink had to bow out for school responsibilities and is being replaced by Canadian Gary Wise. The fifteen round robin rounds will be held Tuesday, Wednesday and Thursday with the finals held Saturday night. To allow the tournament to be played at E3, we ended up moving it back towards the end of the Pro Tour season. This is why there was no Invitational held in 2003. If you're interested in watching this week's event (and remember you can only watch finished games and not games in progress), here's what you need to do. Whew! As you can see, the Invitational has a lengthy history. I hope my little peek into the past has whetted you appetite for this week's event. Join us Tuesday through Thursday and Saturday to see this year's Invitational go down in the history books. May the best man (or possibly the best card) win!